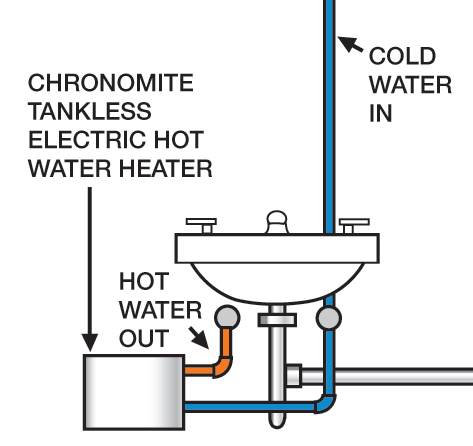 Chronomite was the first to patent a microprocessor technology that allows for a factory preset or microprocessor controlled output temperature that delivers unlimited hot water without risk of scalding—in two seconds as opposed to the six seconds required by other tankless water heaters. Chronomite is installed at point of use and is only operational when hot water is streaming through the plumbing, thus dramatically reducing hot water delivery time and inefficient use of electricity. Greater efficiency means less water and energy use, which is 99 percent energy efficient compared to conventional tank water heaters. The compact, easy-to install unit also provides solutions for projects with limited space and access. At the size of a standard dictionary, Chronomite tankless water heaters are well hidden for aesthetic appeal, and can be placed within a specially designed compartment underneath Acorn hand washing systems and basins. Chronomite also integrates energy and water conservation with cost savings and many features that contribute to a safer environment. With Chronomite, gas leaks are eliminated, and the flow through abrasive action of water creates a self-cleaning feature eliminating alkali and calcification buildup, reducing the risks of corrosion and flooding and reducing maintenance and operational costs.